Today, when many mention the VA, its name is said with less than reverent tones. The VA today is a complicated network of benefits, eligibility requirements, and waiting periods. While their execution sometimes falls short, their mission is a virtuous one. This mission, to best help veterans and their families after their military service, has a long history. While conflict has changed, and so have the men and women in uniform, the VA’s mission has stayed the same. Here at Patriot Angels, we have a similar commitment. We work with veterans and their families to help them navigate the complicated VA benefits system and apply for the Aid and Assistance Pension. If you want to learn more about the mission of the VA, read on and see how we hold the same ideals. The first instances of providing veteran benefits in the United States were in the early 1600s. After the Pequot War, the Plymouth Colony helped care for any man who had been disabled in the fighting. The Pilgrims recognized that military service could have a long-lasting impact on the lives of service members. Benefit systems like these were developed more clearly during the American Revolution. The fledgling nation offered a variety of reenlistment benefits to those who joined the Continental army, including providing pensions to disabled soldiers. In the early days of the country, individual states and towns were in charge of providing care for their veteran communities. The War of 1812 led to the establishment of the first veterans home in Philadelphia. The Mexican American War in the 1840s produced thousands more of veterans. The Civil War led to more than 1.6 million Americans claiming veteran status. With the rapid expansion of the veteran population in the United States after the Civil War, the federal government reacted by carrying out a series of policies and moves. In 1873, Congress created the National Home for Disabled Volunteer Soldiers. This organization was made up of dozens of individual branches that cared for soldiers who served in the Mexican-American, Civil and Indian Wars, as well as non-combat veterans. These homes continued to expand through the end of the 19th century, and into the 20th, soon providing a level of medical care only matched by hospitals. Given that WWI brought with it a new kind of mechanized warfare, it was also time for the Federal government to change how they provided benefits to veterans. Congress established programs for disability compensation, provided insurance for military personnel, and created vocational training opportunities for the disabled. By the 1920s, three agencies provided benefits for veterans: the Veterans Bureau, the Bureau of Pensions, and the National Home for Disabled for Volunteer Soldiers. While this was effective for a time, the three different organizations offered different levels of benefits and care. President Herbert Hoover recognized that three organizations were not necessarily better than one, and consolidated the three groups into the Veterans Administration, now a federal-level administration. This move would prove to be a fortunate one, as the Second World War brought millions of Americans into armed service. The result was that the United States had a veteran population of nearly two million by the 1950s. Meeting the needs of this newly-minted veteran community, Congress created the GI Bill. The bill was a forward-thinking piece of legislation that helped veterans receive education and job training after their service. It provided loans that incentivized home and business ownership. It also arranged for a small living stipend for veterans seeking employment, and increased funding to establish more veterans hospitals across the US. The GI Bill proved to be a popular and powerful VA benefit. The Bill was reexamined and expanded to include veterans of the Korean and Vietnam wars, and veterans who had served in peacetime. Today, the GI Bill has again been modified to assist veterans of the wars in the Middle East after 9/11. In recent decades, the VA has been reformed and reimagined. 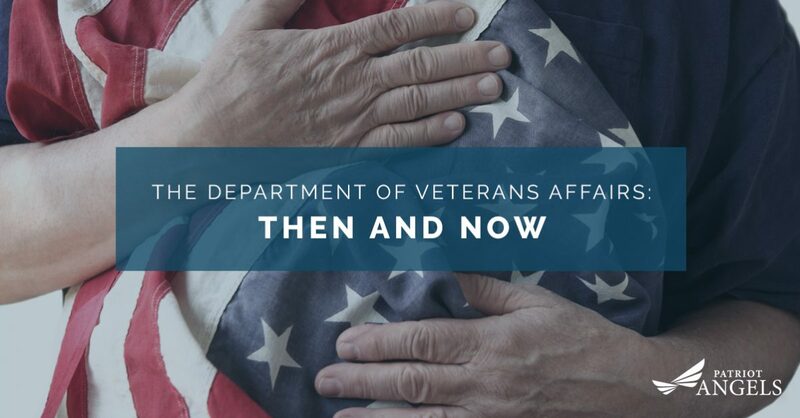 President Ronald Reagan, who had served in the Army in WWII, made the VA a cabinet-level administration, and renamed it the Department of Veterans Affairs, but the department maintained its VA moniker. The 1990s saw a slew of medical reforms in the VA, extending its benefits of health care to all veterans, regardless of whether they had service-related injuries or issues. Today, the VA remains a topic of heated interest and debate. Many veterans and veteran organizations complain that the VA is overly-complicated, and does not provide timely services. To address this, groups like Patriot Angels have stepped in to help veterans gain more immediate access to the VA benefits they have earned. Patriot Angels specializes in helping veterans and their surviving spouses apply for the Aid and Assistance Pension. This pension is designed to provide financial aid to veterans who need long-term assisted care to maintain the quality of their daily activities. If you’re struggling with the VA website to get the VA benefits you or your loved one is entitled to, contact us today. We promise to help in any way we can.